What is there to be said? News articles abound, generally containing accurate info about this very, very special film stock. Kodak announced its discontinuation on June 22, 2009, and the last day you can get your Kodachrome processed (by the indefatigable Dwayne’s Photo) is today, Thursday, December 30, 2010. 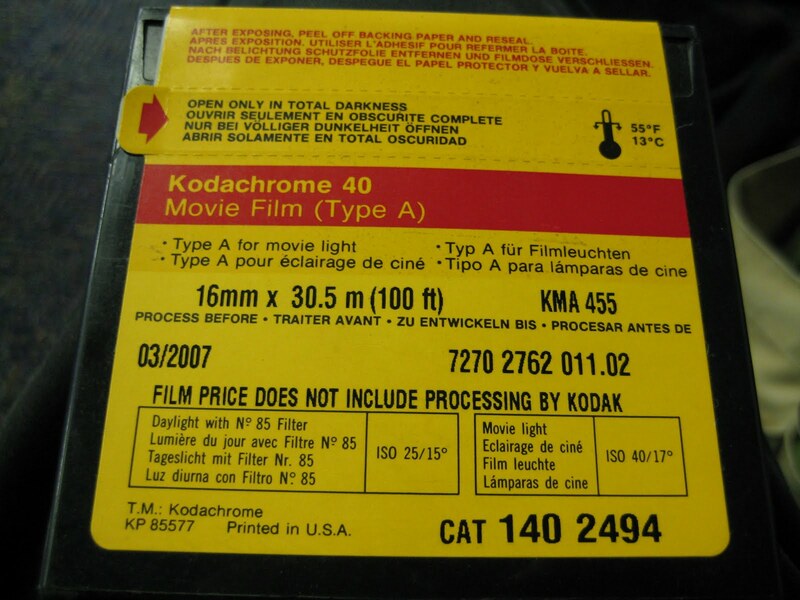 The photo above shows the one and only roll of 16mm Kodachrome I ever managed to shoot in my life. I bought it a few years ago before I even owned a 16mm camera, and shot it only a month ago or so, and just sent it to Dwayne’s two days ago. Very curious about how it’ll come out. I also sent six Super 8 rolls, from which I expect varying levels of successful/unsuccessful processing – one of them was shot in 1986 by me as a kid, one was shot in 2007 on stock from 1984, and the rest are of more recent vintage, but stored inconsistently over the last couple of years. Hopefully there will be some positive surprises. …not to mention the various avant-garde films that were saved and ONLY preservable/restorable thanks to the existence of a Kodachrome (7387) print. Common up through the ’70s, Kodachrome prints were color reversal prints on a variation (?) of Kodachrome, usually meant for printing from lower contrast originals, like ECO (Ektachrome Commercial). Like the camera stock, these prints are gorgeous, and have incredible color stability. With the introduction of a higher contrast Ektachrome print stock in the early ’70s, use of the Kodachrome print stock diminished until it was discontinued altogether in August 1981. But because these 1970s ECO originals are often faded, or originals may be lost, it’s the ultra-fine, ultra-stable Kodachrome prints that can alternatively provide the basis for a restoration, to impressively high quality results. And for those of you who have found yourselves with some Kodachrome you didn’t get around to shooting in time for the processing deadline: Remember that Kodachrome can be processed as black and white, so it’s not entirely useless now, and I’ve heard you can get interesting results. (In fact, Kodachrome is technically a black and white stock, with the color dye only being created in the processing – this is a large part of why it’s so complicated to process.) Or, consider donating an unused box to a local film archive or film museum to be saved as an artifact. Hope everybody who had wanted to shoot it got to shoot it. Crazy to think of an analog in other arts/media – is there one? I suppose one could lament never having had the chance to shoot on 1/2-inch open reel video, but the decks and cameras still exist and you could always use old stock, which is plentiful, though it might involve taping over something. Obscure forms of printmaking are still doable, as are numerous uncommon photographic processes. You can still paint with centuries-old oil paint recipes if you really want to and people are making absinthe traditionally again. What other art form besides photographic film (and definitely video too) is so technologically dependent as to render entire avenues of creative and/or technological exploration utterly obsolete, unattainable, killed? Then again, Polaroid was saved from this fate by passionate supporters, so maybe there are possibilities for Kodachrome, though I’m very doubtful.